The BRITS is the biggest week on the British ski and snowboarding calendar, where the best of our home grown talent battle to be crowned British champion. But it’s not just for the pros as Sportsister’s Louise Hudson discovered. For the last seven years the Swiss resort of Laax has been invaded by the cream of the British ski and snowboarding scene. 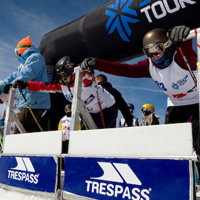 Throughout the week long event our top snowsports athletes compete across four different disciplines; Halfpipe, Big Air, Slopestyle and Cross. It’s easy to see why Laax was chosen for an event like this. Described by the World Snowboard Guide as ‘pure snowboard heaven’ it’s about as far removed from your traditional ski village as you can get. Forget Alpine chalets and fondue restaurants, we are talking modern design hotels and Asian cuisine here. The whole resort has a young, urban feel to it despite being in the heart of the Swiss Alps. 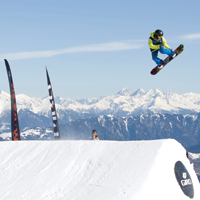 In fact Laax is widely regarded as Europe’s top freestyle resort and as well as hosting the BRITS also holds both the European Snowboard and Freeski Opens. And it’s easy to see why. With 220km of piste, heaps of freeride areas plus two half pipes and four snow parks it’s a freestyle mecca. Adding to this they opened a Freestyle Academy last year too. The first of its kind in Europe this indoor centre complete with foam pit, ramps and trampolines, allows riders of all levels to practise their tricks in a safe environment before heading out on to the slopes. The great thing about the BRITS is that you can enjoy your time up the mountain and then when you start to get tired, or feel like you need a bit of inspiration, just make your way over to one of the competition sites and then you can chill in the sunshine and watch some top class action. 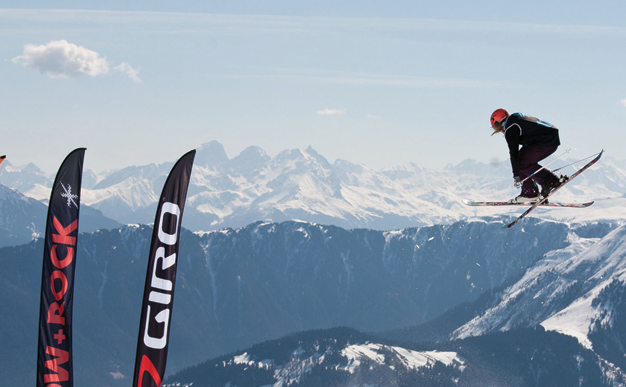 Three of the four disciplines here are now on the Olympic calendar after Slopestyle was added to the line-up for the Sochi 2014 Winter Olympics. But my personal favourite to watch was the ski and snowboardercross events – where four competitors race simultaneously down the course. Fast, exciting and adrenaline fuelled – and that was just as a spectator! And it doesn’t end once the lifts stop running. Make your way back down to the bottom of the slopes and in the village each night there will be plenty to keep you entertained during the après ski hours. With live music, a demo village so you can try out new kit on the slopes the next day and the always atmospheric, but rather unfortunately named Crap Bar, it makes a great end to a day up the mountain. Then there’s just time to head back to your accommodation, change and grab some food before the real party begins. Every evening there is a different event held at one of the venues in the resort and your BRITS wristband gets you access to them all. Top bands and DJ’s are flown in, there is an annual fancy dress party, and it all goes on well into the night. If you are looking for a quiet week on the slopes then this is not the spot for you but if you are searching for something to set this year’s annual pilgrimage to the snow apart from others I’d recommend you consider the BRITS. Because on top of the excellent runs, efficient lift system and beautiful scenery you also get to watch an amazing championship in a resort that’s buzzing with BRITS fever. Katie Summerhayes – 16 year old Katie is the name to drop in the British freestyle skiing scene. Hailing from Sheffield she now has her eyes firmly set on the Sochi 2014 Winter Olympics. She is the current British Slopestyle and Big Air champion and competed in last year’s X-Games. Her younger sister Molly joined her on the podium in Laax picking up bronze in the Slopestyle event. Katie Blundell – Katie only made the switch from skis to snowboard when she was 21 but hasn’t looked back since. She won two silvers at last year’s BRITS in the Big Air and Slopestyle events adding to her Big Air gold from the year before. How do I get there? LAAX is a 90 minute transfer from both Zurich and Friedrichshafen Airport. What does it cost? Prices from @295 excluding flights. This includes 7 nihts accommodation, 7 day lift pass and your festival wristband.